If you see an affordable and worthwhile VN on NetRide that I have not listed, please tell me so I can add it. For those VNs listed above which have translation patches, please tell me whether or not the patches work on NetRide's download versions so I can add that information as well. You will need a debit or credit card from Visa or Mastercard to make any of these purchases using the method detailed in this guide. 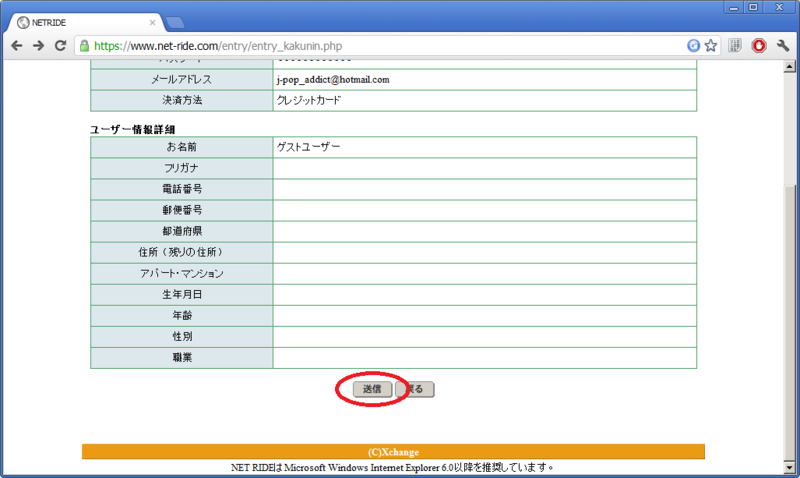 Note that NetRide works best with Internet Explorer, though at the moment it seems to work fine for Google Chrome and Mozilla Firefox as well. If you choose to buy a VN from this site, please leave a comment telling us what you bought. Knowing how many of you are willing to pay real money for VNs is crucial if we ever want the official translation business to improve. 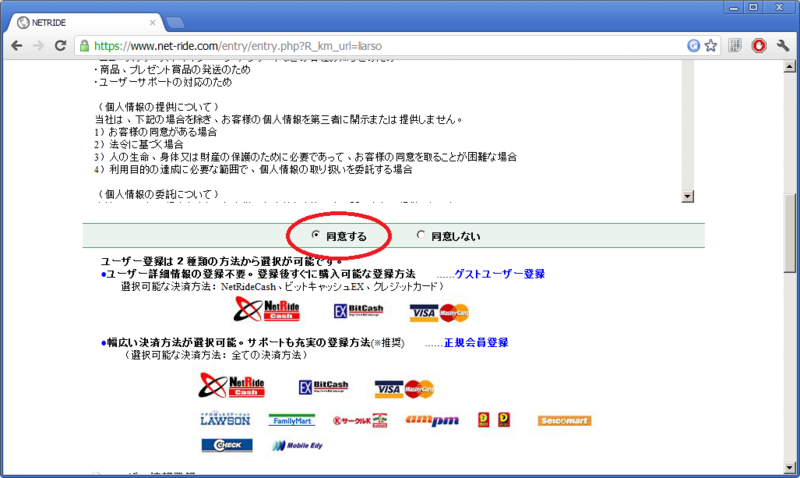 Also make sure you click the right-hand radio button at the bottom to stop them from sending you a newsletter. The radio buttons I boxed in green are, from top to bottom: NetRideCash, Credit Card (VISA or Mastercard) and Bitcash EX. I am going to assume that, like me, you want to use a (Visa or Mastercard) credit card for this, so be sure to click that radio button. 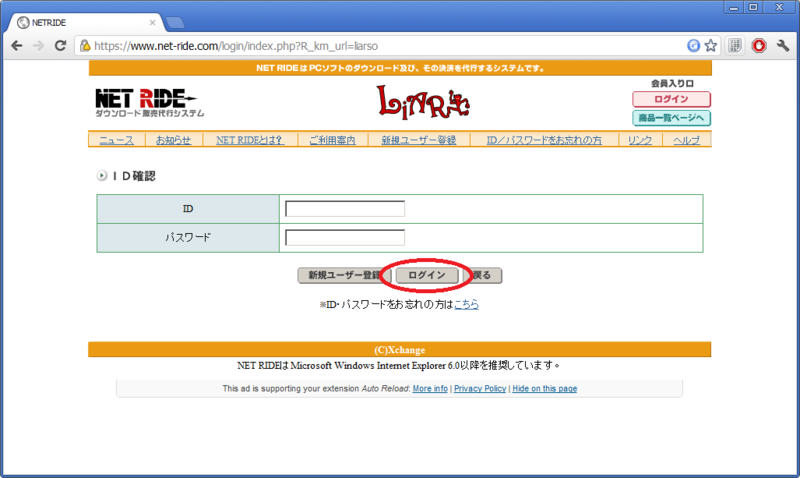 Click the button I've circled in red to confirm you want to create this guest account. 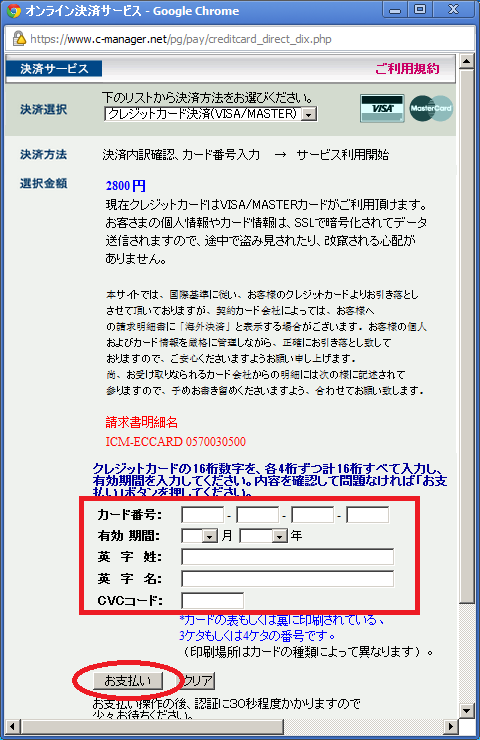 Now, finally, we're at the part where you enter credit card information. 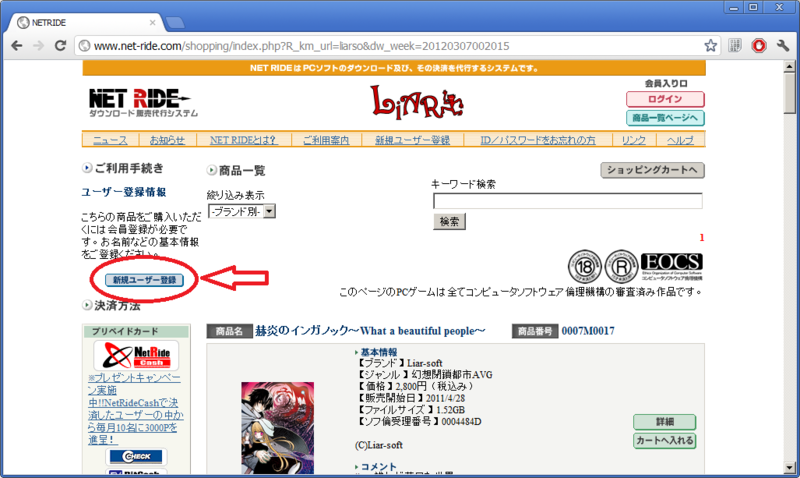 Click the button I circled in red to go to your download page. Only one more step! Click the pink "download" button I circled in red to finally start the actual download. If the VN does not use Soft Denchi (see next section if it does), your browser should begin downloading a file called "downloadfile.lzh". For me it takes forever to download VNs from this site, so prepare to have this download going on in the background for a while. 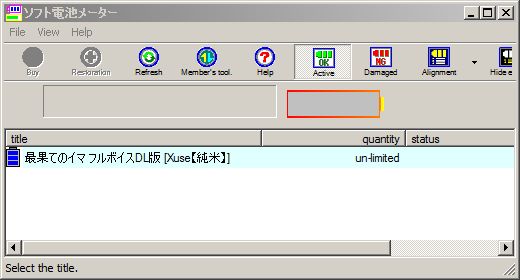 Once it's done, use WinRAR or some other archive software to extract the VN from the .lzh archive. You should now be able to run it by simply double clicking on the extracted .exe. 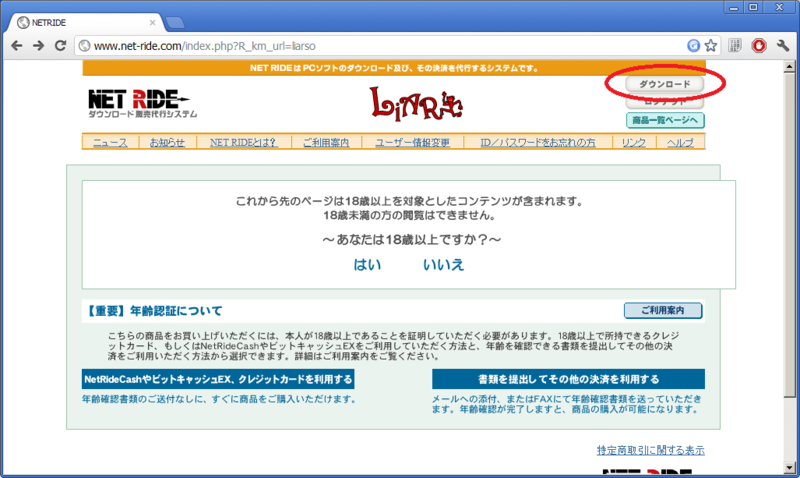 You can redownload the .lzh whenever you want, and there should be no DRM. 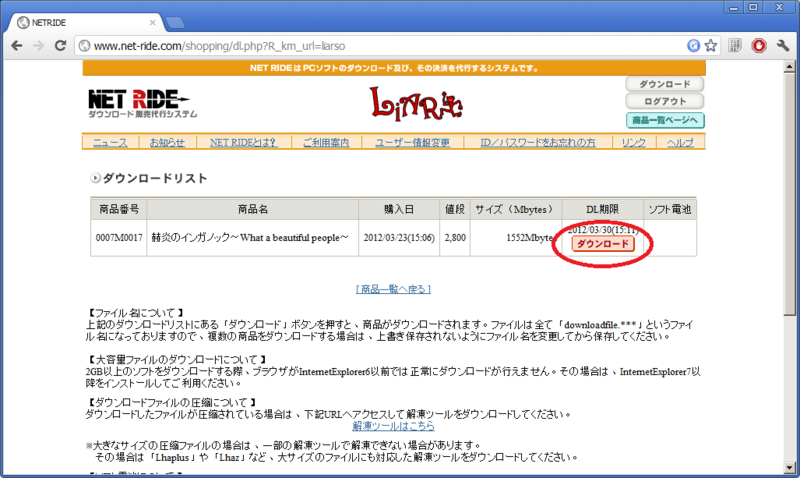 Again, click the pink "download" button I circled in red to start the actual download. 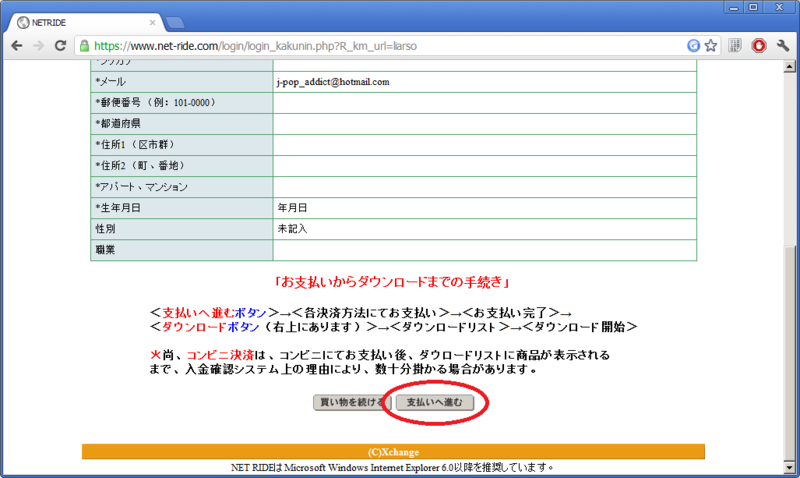 In this case, your browser should begin downloading a file called "downloadfile.exe". This download should also take forever to finish. Obviously, run the .exe when it finishes downloading. It will start the installer, which like most Japanese installers you should be able to guess your way through without much trouble. 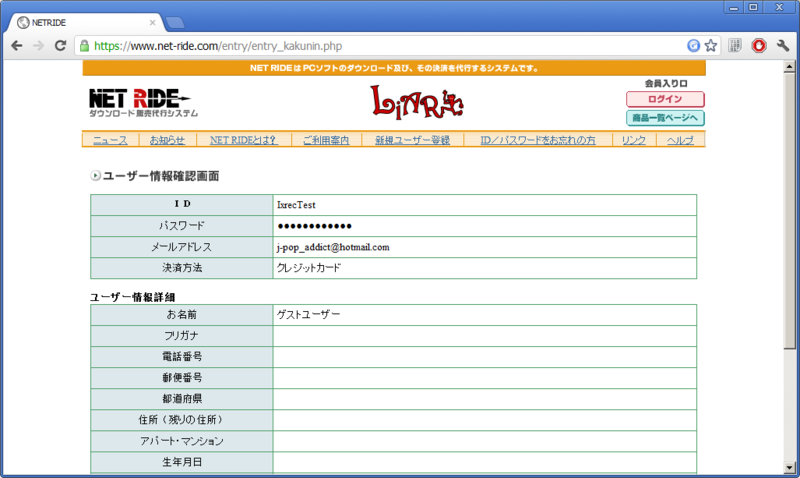 In this screenshot you can see I've already authorized my copy of Saihate no Ima. 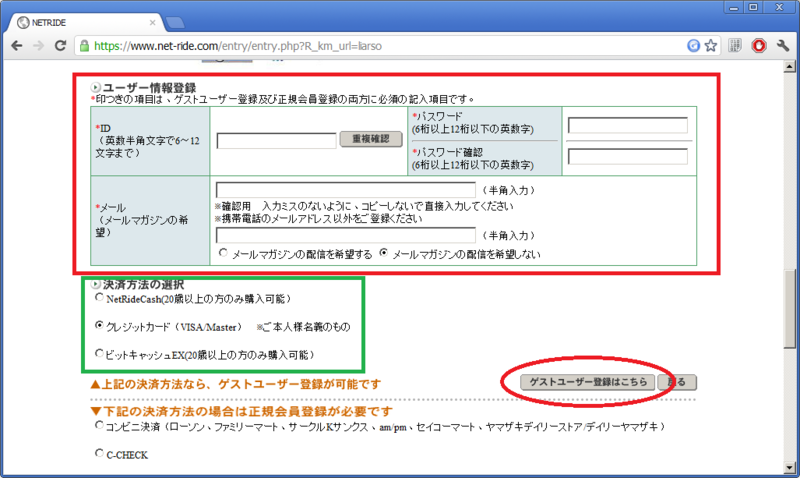 To do this yourself, choose "File", then "Charge by the number", then type in the authorization code on your NetRide download page (I circled in it green earlier) and click "charge". You should now be able to run the VN you bought. Please post a comment telling us what you bought. Also tell us if some part of this guide doesn't work, or is needlessly confusing, or if the site appears to behave differently for your favorite browser. Inganock purchase succeeded with MasterCard credit card. There’s additional step after “Enter your username in the top textbox and your password in the bottom textbox, then click the button I circled in red. You should see this page:” where I get to see this page instead http://i.imgur.com/mjTl1.jpg and I just need to click the right button to land to the next step in the guide. Updated guide to mention that. I am not the intended audience for this guide but as someone who has bought several games from Liarsoft’s DL service in the past I figured I’d chime in. Specifically, I think it should be noted that there are no differences between the original package editions and download versions for any game except Kusarihime, which was upgraded to 800×600 (and with non-CDDA music, thank god) for the DL version. In other words, though Inganock and Celenaria have now been rereleased with full voice, the DL versions are the same as the originals in that regard. Of course, that’s probably implied by the statement that the Inganock patch works on the DL version, but you can never be too careful. As for Forest, hope you guys can get a patch working for the DL version of that soon, since that’s sure as hell never being rereleased. :( Wouldn’t mind some touched up CGs and voice for Akeru and the fairy tale creatures in that myself. Oh yeah you misspelled Valusia up at the top there. Fun fact, the term Valusia was not invented by Lovecraft himself; it came from his friend and close correspondent, Robert Howard’s short story, The Shadow Kingdom. So yeah, the guy who wrote Conan the Barbarian ended up having stuff from his stories canonized into the Mythos. Pretty cool eh. The short version is we are trying to do something FVR-related very soon. I’ll avoid mentioning details until we’ve actually done it. Bought Forest. Haven’t even read it yet, just felt like doing it. ;-) It’s even cheaper in Euro anyway. I’ll be waiting for FVR to get around to the WAB series, though. Used FireFox and bought from Europe, no issues. 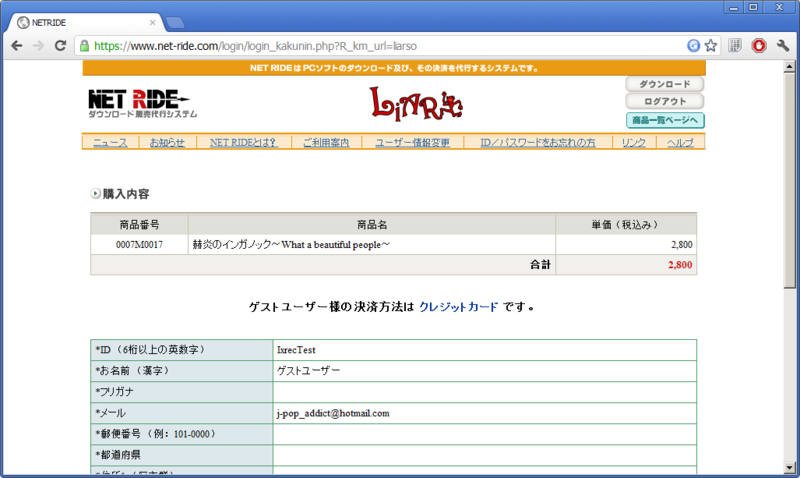 Downloading using a download manager (Orbit), so the site seems to be compatible with them. Just one thing… even though it’s implicit in the procedure and sorta stated at the end, I think the guide should still be more explicit in stating what that site means by ‘guest’ account. Usually, guest accounts don’t allow logging back in to download games after the provided links expire, this is true even for DLSite. If I understand correctly, it’s a “guest” account because it doesn’t have private information like e.g. name and address, so you can’t buy from kombini and the like? That’s my understanding as well. And good idea, I’ll clarify that. Clarification added. Thanks for the guide, Ixrec. I just bought Forest. I didn’t bother with Inganock since I already have the FVR version of it (along with Sharnoth’s). The most appealing part to buying a game for me is having the case to just look at and collect. Still, this is a cheaper way to show supportand any at all is a great thing in my book, so good job on the guide. While I haven’t bought any Liarsoft VNs from that DDL site, I did buy the Fullvoice Reborn box set (which was worth every single penny) and Shiei no Sona-Nyl from Amazon.co.jp and had it delivered through Tenso. 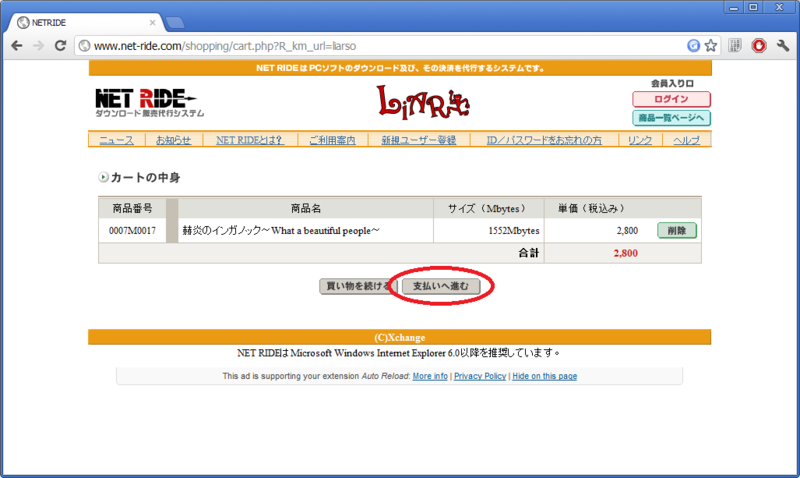 Though a bit expensive, it’s another efficient way in getting Liarsoft VNs (or VNs in general). Good job on the guide, though. Thanks. I’m also planning on making an amazon guide at some point (including mention of Tenso). I was under the impression Imouto Ijime was just a nukige. It is, and not a particularly good one. It’s only anywhere near interesting because it has an English patch. Eh, I guess a passing mention here in the comments is all it deserves. This site also has VNs, particularly Remember 11, Never 7, and 12 Riven, for 500 yen (6 dollars a piece) until April 8th! Take advantage while it is around! I had already purchased Saihate no Ima in the past from that site (or a similar one), but I thought it worth mentioning here for the purposes of adding my voice. Now strongly considering a Forest/WAB purchase as soon as I clear my backlog more/have a ton of spare cash. Considering the fractured time periods I have available for reading and the fact that the backlog includes the Terra route in Rewrite, and most of Oretsuba R/the aforementioned Saihate no Ima, that might take a while. Considering the non-sale prices are only 1500 yen (which is still ridiculously cheap by VN standards) I think I’ll wait until the sale ends and buy E17 then. 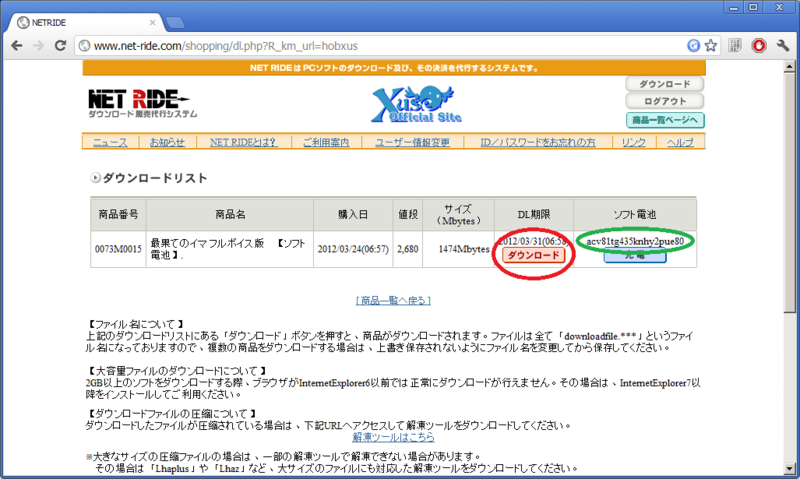 Just wanted to say that I would be very interested in guides for purchasing VNs from http://www.gameliner.jp/ so I can grab Remember11. Also would love a guide to grab the FVR version of Inganock. Oh, Ati’s voice~ Nya! Thanks muchly for the guide, Ixrec! Might just have to cancel my Saya no Uta pre-order with J-List and buy the original Japanese version. I love Saya no Uta and want to support it, but JAST USA has just handled it so poorly that I no longer want to purchase it from them. Thanks. Still might make one if I can find the time. What did they do wrong with Saya? Still hasn’t been released yet and still no release date announced. I’ve had it pre-ordered for since July ’11. I think it was originally slated for fall of ’11? Don’t quote me on that. Plus, they originally had it packed with Hanachirasu for $30. Then after accepting pre-orders they decided to split it up so that Saya no Uta costs $25 and Hanachirasu costs $20. I vaguely remember the split up being something Nitro+ told them to do, but yeah I see your point. Edit: Actually I’m pretty sure both of those complaints are more Nitro+’s fault than they are JAST’s (lol). Though it’s still valid to be fed up with it. Well, all I have to say is this: If this is how Nitro+ handles official localizations of their products, then I say let fan translators handle translation and screw official English releases. That being said, JAST still holds some blame. It WOULD be nice if JAST could, you know, give some updates once in a while. Plus, I’m a little upset at J-List too: JAST posted about splitting up the games on Decemer 28th, and I didn’t get an e-mail from J-List asking me what I wanted to do with my pre-order until January 9th. Thanks for the guide. I bought Forest and the guide worked perfectly, the credit card information just popped up in a new tab in Firefox for me rather than a window. It’s probably available on other sites as well if it’s available there but I didn’t bother to check. I didn’t buy it because I already have the DVD version but I wonder if the patch would work with that version. Interesting. I might add something on these sites when I get around to doing more of this. * Either download links expire, or I don’t know where to look, because I can no longer download Forest which I bought when this guide was posted. I back everything up, so it’s no big deal for me, but unless I’m missing something people better be warned. No idea if this is different for SoftDenchi protected games. * It seems like it’s impossible to make a single order across different developers. Carts won’t combine. Leave only ‘form & search history’ check. (If you do it immediately after buying, you can just erase from last hour or so; otherwise you’ll have to erase from longer. I had to erase all my form history since I bought Forest in March). IOW: lovely late 90s interface you got there, NetRide. Also, KimiNozo comes with “Another Episode” (Kanashimi wa Kaze no Youni), which should be the First Edition bonus from what I’ve found. Worth mentioning perhaps. 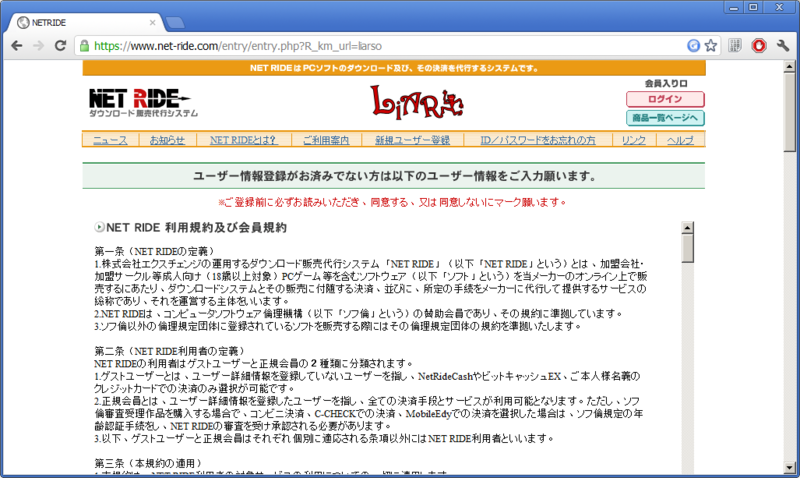 Looking forwards to more guides, well, I know enough Japanese now to figure out most of the interfaces, but I’m not sure which sites accept foreign credit cards like NetRide. I would think getting back to the download page just involves repeating the last few steps of the guide. I honestly don’t know if there is a download “link” of any description (and I would hope there isn’t because that just screams “no security whatsoever”). I have actually tried re-downloading a VN or two myself because I wanted to be able to say if it allows that or not, and I had no trouble with it at all. I can get to my account’s downloads page just fine, and the download links are there (why wouldn’t they be? ); it’s just that only KimiNozo and SnI are there currently, and I can’t figure out why Forest (which I bought months ago) is not. Okay, that is pretty weird. I never had that experience when I was testing. Did you use multiple accounts or something? I ended up doing that so I could get the pictures of making a new account, so my purchases are under separate accounts. If I understand correctly, there’s a week of unlimited downloads, then that’s it. I checked and the notice is on the other orders, too. Somehow I have never seen that. Thank you for pointing it out. 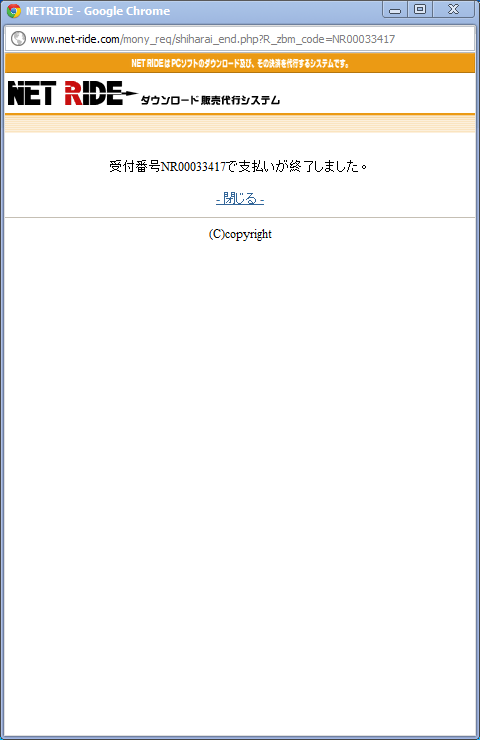 They are forcing a password reset on all users. Since CC information isn’t saved for guests, this shouldn’t seriously affect anyone who’s used it here. Just bought Forest. I’m a fan of mind-screws and deep stories, so I thought I’d give it a try. Thanks a lot for making this guide. Bought Saya No Uta from JAST actually. Not really sure why people are bitching about them. Fantastic visual novel for $25, the translation is solid as far as I have seen, and they even decensored it. I purchased Sekien no Inganock like many others. Thank you for the guide. I feel so much better actually purchasing the product from the producers than finding a skeevy download from the vast recesses of the internet. As I understand, not all games are download editions. For those that are not, in what countries do they ship? Thank you.